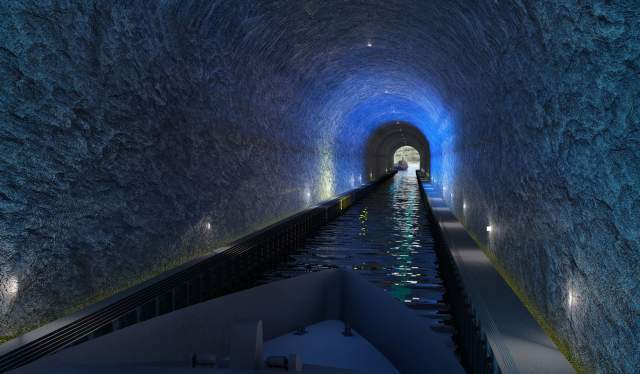 In a few years, you might be able to sail across a 1.7 kilometre long tunnel in the mountains. That guarantees not only convenience, but also a unique experience. Stad Ship Tunnel is the name of an upcoming mega project in Fjord Norway. This weekend, The Norwegian Coastal Administration released new concept images from the project, drawn by the renowned architecture and design studio Snøhetta. The world’s first ship tunnel will be 1.7 kilometres long, 49 metres tall from bottom to ceiling, and 36 metres wide. 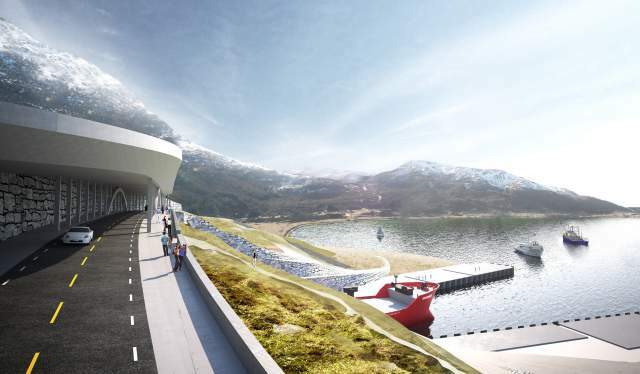 If the politicians decide to give the project the green light, Fjord Norway will get a major new tourist attraction. The cost of the tunnel is significant, though, with a preliminary budget of NOK 2.3 billion (EUR 254 million). As you can see from the images, the project is meant to have a high aesthetic value in addition to the practical matter. “In such a delicate landscape, the tunnel has to be more than just a foul intervention in nature. We put a lot of effort in making it aesthetically appealing”, project manager at the Norwegian Coastal Administration Terje Andreassen says to NRK (article in Norwegian only). The tunnel is built to allow major ships the size of the Norwegian coastal steamer Hurtigruten to navigate safely through the exposed Stadhavet sea, an area notorious for fierce weather. If everything goes according to plan, somewhere between 70 and 120 ships will be able to pass through the tunnel at a daily basis. The tunnel will have its northern access in Selje, and its southern access from the Moldefjord. A bridge is being built over the southern access, which lets the audience watch the ships as they pass through the tunnel. The access on the northern side however, marks itself with luscious horizontal ledges. The drawings by Snøhetta is part of a photo project initiated to give the politicians a foundation to base their decision on. The idea to build a ship tunnel has been discussed for more than a century. The first plans were drawn as early as in the 1870s, while Stad has been known as a troublesome area for ages. Historians have even documented how the Vikings used to drag their ships on shore instead of risking to sail across Stadhavet. “We’re hoping the plans will be sought through after the new year. Hopefully, we’ll get a final political decision by Easter. The earliest start of construction is expected to in 2019”, Andreassen says to NRK. The architecture firm Snøhetta is known for several award-winning buildings in Norway, like Oslo Opera House, Viewpoint Snøhetta and The Petter Dass Museum in Alstahaug. Hurtigruten’s new environmentally sustainable ships can give tourism a new dimension, according to the environmental organization Bellona.